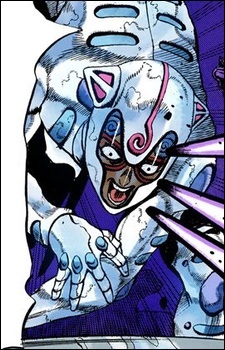 Ghiaccio is a minor antagonist from Part V: Vento Aureo and a member of La Squadra di Esecuzione. Ghiaccio is quite confident and arrogant. He believes his stand makes him invincible, and he lords it over Giorno and Mista in their fight. He also seems to have a certain level of friendship with Melone and great loyalty to the execution squad (and by extension, Risotto Nero). He has a strange fixation with language as he expresses annoyance at the confusing wording of metaphors and over the fact the names of cities are adapted when using other languages. His stand is "White Album".